Crating is not an easy task. It will take some time for your pooch to adjust to it and for you to get a hang of successfully doing it. Here are some tips to remember to increases your chances on successfully crate training. 1. Don't forget to consider your dog's personality when buying the crate. This should also include his needs. There are two types of crates readily available in the market, the one made of plastic and the other made of wire. For a shy type, the plastic type can give him more privacy. The plastic type is also the crate accepted in plane travels. The wire type is more airy and conducive for pets with snub-noses. Since it is open, your dog can see what's doing on outside. Box types are out. This is an eiCrate designed by Peter Pracilio for designGO! 2. Do consider your dog's size in crating. Fido may be a cute puppy NOW but he will grow into a dog eventually. If the crate is too big for him now, create a divider for it. For a puppy who doesn't chew, a thick cardboard will do. 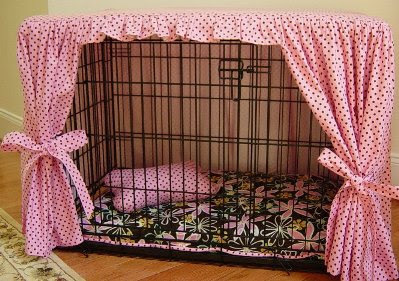 Not only will your crate be able to accommodate your puppy now, but it will also serve him until his adulthood. 3. Do introduce the crate gradually. Dogs get stressed to so it's important that you make him accustomed to the sight and feel of the crate first before you put him there for the night. Observe how he interacts with it and wait for the right time before finally making him move in. 4. Do not use the crate as a prison. Your dog should not be left in there for a long time. 5. Do not lock him up in the crate during his initial meeting with it as this will make him associate the crate with something negative. 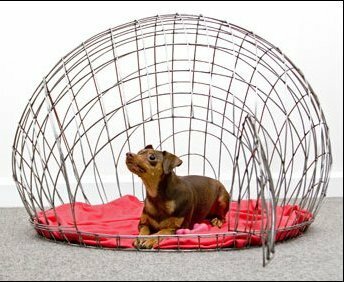 Now that we've covered the more general rules in crate housetraining, always remember that the most important thing to consider is that a crate will serve as your dog's home or den. So if you're having doubts, just go back to the basics of your dog's primary need.